On Thursday the 7th of August, I attended the Post Graduate Research Symposium at St. John’s College in Durham. The Institute for Advanced Studies hosted the event and Dr. Mark Ogden chaired it. The event had 10 speakers over 2 sessions. The format was 15 minutes for presentation and questions from the audience. The speakers were a mix of graduate students and post-doctoral students and the topics ranged from sharks to the Old Testament and the Phenomenology of Privacy to the ultra-cold world of atomic physics. The first speaker was Rosalind Jelf who presented her MA thesis: Generational Memory and Photography in Post War German Literature. The paper looked at the way four writers used photographs to create memory and protect memories. The writers dealt with the way the previous generation was involved in National Socialism. Through the photographs, the writers could explore a point of view intrinsic to the photograph and the photographer, which was accessible to others. The photographs became memories as well as triggers to evoke memories that others could access, which raised the question of how photographs can transcend language or culture and yet remain embedded in them for their meaning. As it is easier to manipulate photographs, the memories that rely on them can be manipulated, which is why it is important to understand how they interact. Her paper offers a way to understand how photographs shape memories and the reciprocal relationship between memories and photographs. Xia Yiqing’s paper Some Explorative Thoughts on the Effect of Competition in the Health Care Sector was next. It was a timely reminder of the historical context for the current debate on the NHS. His paper discussed the ways in which the industry would be regulated by introducing competition and, in turn, this created a wide series of changes within the sector that occur beyond the headlines. The third paper was cold, very cold. Alistair Bound presented his research on atomic physics. In Ultracold and Very Small: An introduction to Atomic Physics, he took the audience to a very small and cold place. By capturing atoms at a moment just above absolute zero, the research allowed a better understanding of precise time measurement and quantum computing. The work has the potential to improve services that rely on precise location or times such as GPS monitoring or space exploration. The ability to capture atoms and hold them in place also had practical application for quantum computing, which allows faster computing processing. The wider application is the potential to improve computer encryption. The fourth paper let us float down a river. Sophie Tindale presented her doctoral research on water management. Her paper Catchment Connections: new perspectives on Stakeholder involvement in Catchment-Scale Management of Water Resources looked at the way agent based models could help to create better water management. The presentation reflected her first year of work on her PhD. She explored how agent based modelling can be used to improve stakeholder engagement to resolve disputes over the resource and to generate knowledge of the catchment. Water is an important commodity and natural resource that cuts across different communities. Her research will be useful for those who need to negotiate its use and access by different communities and find an equitable solution. The fifth paper by Ben Douglas was taken from his PhD dissertation. The paper The Phenomenology of Privacy in UK Law will be of interest to privacy researchers. His use of phenomenology helps to understand how the individual presents or represents themselves in a community and the way the law reflects representation. He looked at the way Naomi Campbell had presented herself as drug free and the newspapers wanted to change that representation by revealing that she was attending counselling sessions associated with drug dependency. His use of phenomenology to explore this tension offers a way to explore the way privacy is developing and the limits to it within UK law. After the Interval, another set of papers were presented. The first paper in this session was on sharks. Catherine B. Salter presented her MA thesis Evolution and Phylogeography of Mustelid Sharks. She provided the audience within an insight into the typology and classification of the shark. The presentation highlighted the challenges of working with DNA processing to identify the genetic markers needed to classify the shark. She also highlighted the plight of sharks as millions are harvested from the oceans and many are in danger of extinction. Without a proper classification and understanding of the shark’s genetic structure, it would be difficult to protect them. Andrew P. Corkhill’s paper on Yugoslavia’s disintegration into war was next. His paper When Europe Failed Yugoslavia: How the Actions of NATO and the European Union after the Second World War Contributed to Conflict in the Balkans provide a view into the challenge of security within the EU and the limits of EU power. His historical analysis looked at the way that the EU’s security choices, which were heavily influenced by the United States of America, limited its ability to deal with the Yugoslavian crisis. As a result, the EU’s response was insufficient and it revealed that they could not act, even on their doorstep without the USA being directly involved. One area to explore with his research would be the way the EU deals with challenges to dissolution within its own borders. The way that Scotland seeks independence from the UK presents a stark contrast to the way that the breakup of Yugoslavia descended into war. The contrast between the choice of ballots over bullet, which reflects the history of the relationship, would be a rich source of comparative research. Do democracies break up differently? Dr. Mark Ogden chaired the event, introduced each session, and provided context for each presentation. The event offered younger scholars the chance to present their work and it sparked stimulating discussions. 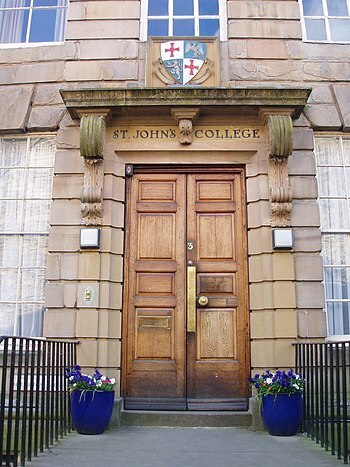 The event is a credit to St John’s College as it shows the depth, breadth, and variety of the scholarship at the college. I enjoyed the event and look forward to future ones. Although I am not involved in academic research, I found the event interesting because it allowed me to interact with people I would not normally meet through my work. The presentations and the scholarship gave me a different perspective and provided an opportunity to talk with a different audience. I would recommend future events to anyone interested in the college’s work and a chance to see younger scholars present their work. This entry was posted in education, good writing, scholarship and tagged Atomic Physics, China, European Union, John, NHS, Post Graduate Research Symposium, St. John’s College, The Institute for Advanced Studies, United Kingdom, United States. Bookmark the permalink.